The main design metaphor draws from the constant sense of movement that envelops the property. This is an amazing project; a private non-profit developer, the Jacobs Family Foundation, has accumulated a sizable portfolio of property and is seeking to redevelop a completely new village within the existing and otherwise largely neglected and ignored Encanto neighborhood in southeast San Diego. This mixed use project is located on 3 acres, surrounded by a mish mash of light industrial, commercial and residential zonings that lacks focus or logical urban planning and organization. The neighborhood demographics prove that it is also one of the most ethnically diverse populations in the entire City. The project consists of approx. 21,000 s.f. of light industrial over a partial subterranean two story parking structure and 64,000 s.f. of commercial/office space. The site is large and located just one small parcel off a major intersection that is a gateway to the rest of the neighborhood. The main design metaphor draws from the constant sense of movement that envelopes the property; which is located at the intersection of two major arterial streets, across the street is a regional bus terminal, the trolley actually traverses the entire southerly property line as does the Encanto Creek, and the flight path for San Diego’s main airport is directly overhead. If that was not enough, there is one remaining latent source of movement found in a North/South earthquake fault that bisects the site almost perfectly in half. The remaining major site feature that had a significant impact on the design process was the 15’-0” of grade change over the width of the site along the Market Street frontage. 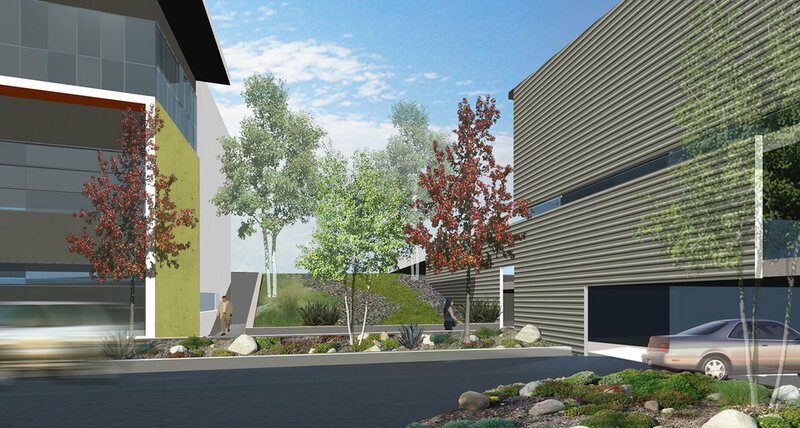 The two story parking structure was pulled furthest away from the view corridors and set against the most dramatic area of grade change providing a perfect at-grade plinth for the industrial building to sit on; necessary for truck access. The more transparent office/commercial structure was pulled closet to the main street and adjacent to the newly improved Encanto Creek pedestrian path to activate and to visually “supervise” these more public uses. Previously completed projects directly adjacent to this site are the first three pieces to the master plan that and include the Market Creek Retail Plaza, the Joe & Vi Jacobs Community Center and the Market Creek Residential condo project. This fourth piece will add sorely needed local employment creation and continue establishing the infrastructure of amenities this community desperately needs to renew itself and continue the revitalization metamorphosis.